Having an acute case of osharephobia, my AnCafe awareness phase hit me during my angsty early days, back before I became jaded enough to have opinions and a sense of distinction about what I listened to. My appreciation for the hyperactive, affectedly-nasal, stressful listening experience was, needless to say, short-lived. Although I never came to dislike the band, and will still even admit to enjoying a few songs (Ryuusei Rocket and Snow Scene pop up on shuffle from time to time and don’t get skipped), I stopped following them or listening actively. That is, until last year when vocalist miku finally won his battle against the chronic sinus-infection that seemed to last, oh bloody hell, like 6 years (poor guy), put the whole project on hiatus, and went off to develop his ennui and strip down to monochrome for the debut of side-project Lc5 and their fresh-faced new-born first single, Loveless. My first impression of them being somewhat in the gray zone, I put them on the short-list and moved on…until the time was right, and I picked up their second single, Story. First of all, the concept for the single is pretty sweet. I’m down with the contrast of density and spaciousness, light and dark. Also, the way they worked the cold, clean lines of the background and the soft furs and miku’s mellow expression. Simple and striking, it’s classy and understated. The titular track, Story, opens with a clean piano line and straight guitar chords that flow neatly into a concise, heartfelt rock piece. The vocals are light and low, and play crisply on the airy highnotes of emotion that prove miku can express elegantly without a stuffy nose. The verses are sweetly satisfying, and the chorus stays out of your face while still being catchy. Like the cover, the title track is all clean lines and soft depth, a sweet rock ballad with a good vocal break and a versatile feel. My favorite part of the song has to be the last third of the track, when they transpose keys, switch up the vocal breaks, and throw in a whammy-riding guitar solo to fade out a well-rounded rock ballad. Story fades into Deeper Than Fate, the meat of the single. Cruising and rocking from the onset, the bassy track is a great middle-ground between tender Story and heavier DIRTY STAR. 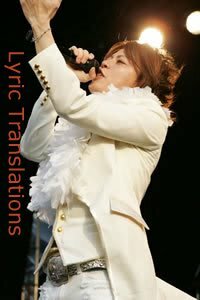 miku’s vocals ring strongly of Hyde back in his early L’arc days of melodic emo wails. In fact, the whole sound of Lc5 does follow on L’arc‘s heels somewhat, creating a strong, classic sound that makes for quality Jrock like bands were putting out in the early 00’s before everyone started experimenting with electronic samples and live mixing (I blame [thank] Toshiyuki Kishi for this). The guitar solos are solid, the bass is well-equalized, the riffs are well-put-together, and everything is orderly and very easy on the ears. The single finishes off with DIRTY STAR, the title of which doesn’t really some congruous, but the actual song is really decent. The jazzy, bassy opening with the airy vocal overlay feels fresh and new, while the vocals spin through another classic Jrock track. The details of the track are great, and I enjoyed the effects they layered on the vocals throughout, mixing things up a bit. The “and”-beat feel of the lead into the chorus creates a trip-up sort of feel that I thought was pretty cool. I will certainly be following Lc5 more closely from now on, and should they [not] surprise us with a full-length album this year, I wouldn’t hesitate to pick it up or recommend others to do the same. I’ve been impressed lately by the amount of cross-media productions Japan’s entertainment industry has been putting out over the past few years. Last year GACKT fans flipped when he set out across the nation on-stage as sleepy-eyed samurai Nemuri Kyoshiro, hell-bent on raising heart-rates, box-office takings, and samurai-spirit in young and old alike. The production also involved the musical prowess of Visual Kei veteran SUGIZO, who composed pieces for the show. On the 8th, in honor of the 12th anniversary of hide’s (X-Japan) death, a rock-musical began showing across Japan, featuring hide’s music as performed by defspiral, and the cameo appearance of J (Luna Sea). Today, March 12th, a movie about a fictional Visual Kei band was released, entitled Maebashi Visual Kei. The movie, a heretical movement on the film-industry’s part to ensure some vibrantly-dyed shackles were raised, stars Johnny’s Ent crony Kazama Shunsuke in the role of a backwater boy in Maebashi, Gunma, who wishes to start a professional Visual Kei band. Legitimate Visual Kei (not a Johnny’s attempt) band heidi. composed the theme song, and appear in the film. The later half of this month will feature some on-screen time for 2 of Japan’s greatest idols of all time, one being the remake of drama Okusama wa 18-Sai with idol-from-the-future Nishikawa Takanori, and second, a biographical drama series following the life of ’80s tearjerker genius Ozaki Yutaka, idol from the past. Ozaki’s music producer Sudo Akira provided a screenplay for the drama entitled Ozaki Yutaka Oboegaki, “Ozaki Yutaka Memorial”, and the series will document the short, but powerful, lifetime of the musician, who passed away suddenly in April, 1992. For the first time, Ozaki’s life will be portrayed via this medium, beginning with 16 year old Ozaki meeting Sudo for the first time, and depicting his struggles and suffering throughout his debut and off-stage life. The screenplay is cited to be as accurate an accumulation of “facts” as possible, being based on testimonies and various “other sources”. On February 12th, unseen video footage was shown during the “Hounetsu no Achira – Ozaki Yutaka Shirarezaru Densetsu” in a documentary. The video footage used was intended to unveil various aspects of Ozaki’s life, and was apparently an important addition to the production. The series will begin airing later this month on TV Tokyo as part of the BS Japan 10th Anniversary series “Ozaki’s 20th Memorial Year – Kaze no Shonen – Ozaki Yutaka Towa no Densetu (“Eternal Legend”). Personally I think that Narimiya was well cast as Ozaki; although I honestly don’t know much about Ozaki’s actual personality and character outside the music that he created and his performances, I think the likeness is strong, and have always enjoyed Narimiya in his past roles. I’m curious to see, too, whether Narimiya actually does the music for the show, or whether they just use recordings. In any case, this is another drama I’m anticipating, even more so than Okusama wa 18-Sai, simply because Ozaki Yutaka was a brilliant artist who left behind a legacy of emotion-packed, powerful music that has influenced many of the artists of today, and his life is worth understanding better. I also think it’s a great move, marketing-wise, for Visual Kei and Jrock to be mixing with television and other media branches, as a way to expose Visual Kei and Jrock to potential fans who, after Googling half-naked images of Narimiya Hiroki, might even venture to sample some of Ozaki’s music. It is with an intense sense of relief that I am sitting here typing this. The past three or four months have been, easily, the most hectic time of my life so far. I realize this is merely the problem of having a productive life on earth, and fully expect it to get busier as the days, months, years go by. I will accept that challenge when it arises, but for now, this time was intense enough to satisfy the morbid cravings of the last shredded remains of any over-achiever in me. The reason that I’ve been away from blogging for so long is primarily thanks to my being committed pretty heavily to my job. Working 10+ hour days, 6 days a week while scavenging a life outside of work can start to add up fast, and during the past 5 or 6 weeks, I felt distinctly as though I was running on the final scrapings of the last reserves of my energy, and physically, all I wanted was sleep, all the time. The only thing that kept me going was the thought, I cannot lose to this. I have a general interest in personal growth and, since my introduction to Japanese social philosophies, an avid obsession with “becoming stronger”. I feel as though this almost-academically-observational sense of perspective of my own experience, as well as that of others’, affords me a certain unsympathetic awareness of my innate human weaknesses and an ability to overcome them. As most of my more melodramatically tragic habits are, I believe I picked this tendency up from GACKT. I thought often of the stories of him literally working until he collapsed, fell ill, etc. While these instances are examples of pushing extremes unhealthily far, the core value demonstrated within them has inspired me greatly, and I’ve carried the base sentiment in the not-so-back of my mind through this intense and hectic period. When natural energy became replaced by caffeine, pain-killers and pure willpower, I got to the point where every day my body was telling me no, while my mind continued to say yes. In the beginning, it was a struggle to make it through the craziness of each day, and in many ways, it only got harder as the weeks went by. But also, like moving through physical pain barriers and the struggles of physical improvement, after a while I could really begin to gauge the progress of my spirit, and how much my capacity to deal with the crazy experience had increased from Day One. Of course, it’s not enough to acknowledge that you’ve grown – from the place of flexing new muscles you didn’t really believe you were building, the desire to become stronger only increases. I think there’s something really interesting in physically, knowing that you need to stop, and yet mentally, wanting to know how much farther you can take it. In my life, at least, that’s at the root of self-improvement. Since we’re in the last week of the year, I’ve been considering the hurdles I’ve faced in 2010, and appraising the resolutions I made, and whether or not I was able to achieve them. At the beginning of the year, I wanted to change a lot of things, and part of that was a resounding desire to overcome the things I was afraid of, to be able to overcome the things within my mind that held me back. I wanted to live my life to the fullest that I possibly could — and not in that wishy-washy greeting-card canned response way; I wanted that sincerely. This is very un-zen, and I’ll own that, but I believe at least part of figuring out how to live life fully, is to increase the velocity of your experience as much as you can. Although this isn’t really “living life to the fullest” at all, filling each moment with something and never letting yourself stop, but constantly continuing to add more to your experience is one way of feeling like you’re living life fully, and as a result, discovering, hopefully, what that desire really means. But as you’re racing along, charging through life, trying to make the most of it, live it to the fullest that you possibly can, at a certain point it seems like it’s entirely too possible to get too lost in the moment, to forget where you’re going, who you are, what you’re working toward and why. The velocity and intensity of experience, any experience, can just completely overwhelm a person’s being, their sense of self. When you run out of energy, and you feel like you have no strength left to muster, I think everyone has to reach a place where they can acknowledge that there is something feeding their determination. That their “sense of self” is, in fact, rooted firmly somewhere. And the more you get stretched out, the more you drag yourself along independent of that origin, that source, the more you end up on the waning tide. Drained, exhausted, those last fragments of energy completely sucked dry, feeling sorry for ourselves, the animal need for rest, sleep, rest sleep, overpowering our vision, making us forget who we are and why we do any of it. We forget how we were even able to do any of it. This is when you realize what your source is. You find that thing that rejuvenates you, restores your strength, reminds you what you’re fighting for. None of it is empty challenge and reaction. For some people, I’m sure that thing that gives you back the will to continue is other people, material pleasures, whatever. For everyone, it’s different. The only thing that is the same is that we all have it, and inevitably, when we’re running on that last store of energy, we return to it. Sometimes we don’t even really know what it is until we’re at the point of total breakdown and suddenly it shows itself to us. But I believe that whether you know it or not, when you’re there at the point of collapse, some instinct or inspirational nudge leads us back to that source place. Without interrupting the flow of what we’re doing, without taking any steps back, without requiring anything other than a sudden burst of awareness, we tune into that one thing that reminds us, blindingly, of who we are and what defines us, what gives us strength and the will to fight. Finally, yesterday I had a detestable moment of weakness. Woke up with a pretty lousy cold, and although my now well-trained mind kept telling me to get up and go to work, to push through it, my body was screaming a pretty strong no. My ravaged immune system needs a break, so I’m giving in. Drained, exhausted, feeling sorry for myself, I instinctively turned to something that my being craved more than sleep: music. Sitting around in the dark, WHAT’S MY NAME playing through at full volume, it was like I was hearing Jrock for the first time all over again. It was like I was hearing music for the first time all over again. All the wiring in my blasted zombie brain seemed to fuse back together again. I was able to remember something I knew all along, but somehow had completely lost track of: Visual Kei and Jrock are that source place I return to when I’m at the point of collapse. Visual Kei and Jrock are what define me, what give me strength and the will to fight. They are what give me the obsession with accepting challenges, and they are what lend me the strength needed to overcome the weaknesses that arise when I am teetering on the point of collapse. It’s this sense of unwavering courage that happens when I’m led to GACKT or MIYAVI‘s music at the right moment that is something I wish I could express in words when I am asked why I am a Visualist. I find that when I don’t write on Secret Garden for an extended time, when I log into my Dashboard, I always experience this strange paradox of both feeling like a complete stranger, and at the same time, like I’ve finally made it back home. I know a few of you have been around for a while now (and I’m still happy to have you, rest assured), and some of the really good ‘uns will probably remember my mentioning a particular anime con that has been honored by my attendance several years in a row. Although I keep saying I won’t go back, and have little to no active interest in anime, I keep going back, utterly unable to resist the gravitational pull of the organized culmination of Japanese pop culture and its cult following. This year will also mark my first step outside the blogsphere representing Secret Garden. You guessed it (or, I don’t know, maybe you haven’t), I have been granted the honor of appearing at the con as the first Visual Kei/Jrock panelist since circa ’07. I’m pretty psyched to have this opportunity, and I’m looking forward to working with the con as a presenter, thus being able to expand the world’s awareness of Visual Kei, one step at a time. Say you saw it on Secret Garden. It is currently 12:03 AM, EST, on September 11th, 2010. Assuming the TIFF folks are as punctual as the Japanese, which they likely aren’t, 12:00 saw the onset of the screening of the official premier of the long-hungered-for film that has been hinted at hither and thither, along with horrible teases such as “2011” and “pushed back”. That’s right, yo. 10 minutes ago (as I am writing this) at the Toronto International Film Festival, they began screening BUNRAKU. I’m not sure what it is. But I feel somehow uncomfortable knowing GACKT is on the same continent. We haven’t quite reached that point of same country or same city or, ideally, same building, but I figure same continent is progress. Still not sure why I feel like I’m being watched, though. I guess it’s ‘his’ overwhelming aura stretching itself across the Canadian border. Well, that’s more or less how I articulate “I wish I was there”. I still haven’t figured out yet whether it’s going to get rough around here when YOSHIKI realizes the American continent isn’t this trembling, vulnerable, innocent creature waiting to be violated by (1980’s) Jrock. There is already a “One” that we have been waiting for, a “One” that will mobilize fans across nations. A “One” that set out to conquer Asia, and having done that, is making his way steadily West. Sorry to interrupt the mood, but, is it just me or does that sword look *very* long? This summer, GACKT left Asia to hit up Europe with a limited international debut tour. And now he is encroaching on the Americas with a (rather brilliant) new step into internationalization. Premiering as I type, before a sold-out audience in Toronto consisting of at least a few Canadian and devoted Various Other GACKT fans, TIFF’s Midnight Madness likely has no idea what it is unleashing on the West. And no, I do not mean Josh Hartnett with his banker’s ‘stache. Films, particularly should they be really excellent ones are a superior form of forcing people to expand their horizons. Unlike music, which, even if you can handcuff someone to a post, stick headphones on them, crank it and hit play, often will go in one ear and out the other, especially if it’s in Japanese (a “foreign language”, god forbid). However, many more people are likely to see a film, especially if it gets decent hype, and awareness of certain persons in the film is much more likely to spread than if we attempted to hijack a shopping center’s sound-system and jack our iPods through it (not that I’m discouraging any attempts). So the question I think we’re all wanting answered is, is his appearance in BUNRAKU, an American film starring big-name American actors, presumably primarily without subtitles for the benefit of our extremely cultured populace, a bold step toward the globalization and mobilizing of the GACKT fandom? As far as GACKT’s interview with “Darryl” of TIFF is concerned, the answer is yes. Did I just read the words “US, South America, Canada” and “next year” used in the same sentence by GACKT?